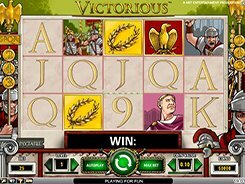 Victorious is an Ancient Rome-themed video slot with 5 reels and 243 ways to win. Winning combos are formed by matching symbols landed anywhere on adjacent reels starting from the leftmost reel. The symbols include images of various Roman warriors, the emperor, attributes of power and standard Nine to Ace card icons. You can start betting from $0.25 and reach a maximum bet of $125 per spin. The slot features a wild symbol, a scatter and the round of free spins. A wild symbol displayed by the Golden Eagle helps form winning combos by completing winning paylines, but its only downside is that the wild does not create its own winning combinations. The Golden Wreath is a scatter with three or more of them unlocking 15, 20 or 25 free games with a x3 multiplier. The scatter symbols need to appear on successive reels starting at reel 1 to trigger the feature. Besides, hitting five scatters pays out the second largest prize of $6250. The grand prize of $7500 is awarded for spinning in five Caesar symbols on adjacent reels if playing the maximum bet.